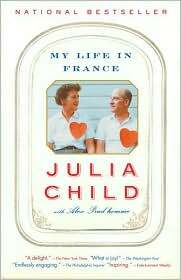 During one sleepless night while I visited my mother in Iowa, I re-read My Life in France by Julia Child to improve my mood. The next week as we vacationed in Santa Barbara, the SB Independent wrote Julie Child would have been 100 this year. 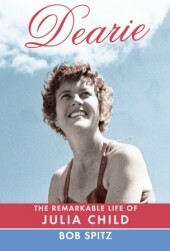 Dearie, a new biography about the city’s former resident was scheduled for release on her August 15th birthday. Trying to keep our luggage light until the final leg of our journey, I waited until we arrived in Newport Beach to shop for books. The Barnes and Noble entry table was piled high with the summer releases. 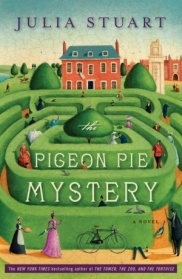 Next to Dearie sat my friend Julia Stuart’s newest release, The Pigeon Pie Mystery. 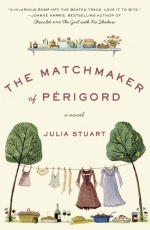 My relationship with Julia Stuart began when a friend gave me a signed copy of her first book, The Matchmaker of Perigord, for my birthday. I picked up both books and during the sixteen hour flight from Los Angeles to Dubai, I finished reading The Pigeon Pie Mystery. Between The Hunger Games and a documentary on Woody Allen, I thought about why I loved her book. Arriving home, I discovered others agree with me. I opened my email to a message saying The Pigeon Pie Mystery was one of Oprah’s two new book picks of the week. “Good for Julia,” I thought. But I wished I had beaten Oprah to the posting. Oprah’s LifeLift blog summarizes Pigeon Pie’s plot but there is something I must add. Julia Stuart tells stories as if she is the village raconteur who knows the history of all parties involved. Instead of being embarrassed by her neighbors, she delights in filling her listeners in on their eccentricities – making mountains out of molehills, or a short story long with delicious tidbits. Her characters swim in life’s tragedies – lost love, dead children, loneliness, regretful deaths, and losing parents. Yet in-between sorrow, she finds laughter, imagines unexpected friendships, fulfilling dreams, and finding love usually at home, in our own backyard. And just when it seems like the story is nothing but one novelist’s over-active imagination, she slides in a historical fact, proving the cliché that real life is stranger than fiction. Her books are described as “witty” or “charming” because she sees life for what it is and instead of focusing on the darkness or negativity, she chooses to write lightly with humor, delighting in people’s diversity of experiences and interests. That’s what I like about Pigeon Pie. It’s a matter of style – how to tell a tragic story with humanity. It is Julia’s positive outlook on life which landed her book on Oprah’s LifeLifts. Thanks for the recommendation. I was looking for a new book. I shall look for Julia Stuart’s books during my next visit to B&N. You have always been a speed reader, my dear. I agree, Eva – I love Julia’s knack for subtle humour and quirky characters, which makes her style as much a reason to read her books as the storyline. I’ve read both ‘The Matchmaker of Perigord’ and ‘Balthazar Jones and the Tower of London Zoo’ (the names are another intrigue) and loved them both. I don’t think the Pigeon Pie Mystery has arrived on Nova Scotian shores yet, but can’t wait to read it and great to know it’s been devoured and enjoyed by you already. Did a little research on Nova Scotia. Seems you traded one small island for another. Funny how we gravitate to what we are comfortable with. There are many beautiful places in Nova Scotia. I will have to invite myself over to visit you one day. I just wish you had picked Vancouver instead, that would have been easier for me. ditto April’s…Thanks for the recommendation. I was looking for a new book. How exciting for Julia – not just to see another book in print, but to have it recommended to a huge US audience. Her quirky characters have genuine appeal .. it will be interesting to follow Julia’s career. I recall that when she lived in Bahrain she demonstrated what it meant to be a committed writer – always putting dow 500 or 1000 words a day. What impresses me about her work, really, is its originality. And that’s a rare gift. I’ll look forward to reading this one. Discipline and passion – that is what we need.